We all remember the year 2000 as the year that The World As We Know It would come to an end. Computer systems were predicted to come crashing down on January 1, leaving in their wake failing infrastructure that would affect millions of lives. In reality, Y2K was a non-event except for a few minor glitches. Today, all those fears that were never realized are a distant memory. At Campbell Scientific, we also remember the year 2000 as the year we released the NL100. You may remember this as the first device that enabled our data loggers to send and receive your data via IP network connectivity. In this article, we’ll take a brief look at the products that have been providing you with convenient Internet access to your data for the last 16 years—with a hint of what you can expect in the future. 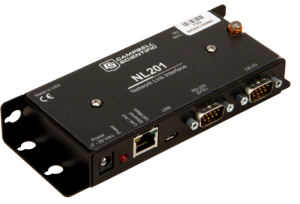 The NL100 enabled your Campbell Scientific data loggers to communicate over a local area network or dedicated connection via TCP/IP. This 10baseT Ethernet device was compatible with all our data loggers, connecting over their CS I/O port or RS-232 port. Additionally, you could attach other communication devices (such as our RF radios) to the NL100, which extended the range of your communication to data loggers further out in the field. We retired the NL100 in 2013, but it was subsequently replaced by the NL200 (2011) and the NL201 (2013, discussed later). In early 2006, we introduced you to the NL115. The NL115 incorporated many of the benefits of the NL100 into a smaller, more rugged package. 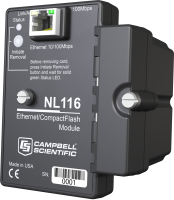 In addition, the NL115 was coupled with a CompactFlash card slot to extend your data logger memory. Compatible with the CR1000 and CR3000 dataloggers, the NL115 was the first peripheral device to allow these data loggers to display web pages directly on the Internet. In 2015, the NL115 was replaced by the NL116, which added the benefit of integrated surge and ESD protection. The NL120 was released in 2009 and upgraded to the NL121 in 2015. With a lower price, these devices offered you the same benefits of their NL115/NL116 predecessors—without the CompactFlash card slot if you didn't need the additional data logger memory. The NL120 was retired in 2015, while the NL121 is still going strong. Although the NL201 (2013) is a follow-on product to the NL100, it deserves a mention of its own because of the powerhouse of capabilities it brings to the table. 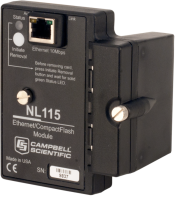 Using unique technology to bridge the Ethernet and CS I/O ports, the NL201 provides you with direct access to the integrated IP functionality (web page access, email, FTP) of our IP-capable data loggers. The NL201 can also act as a standard TCP serial server, serial client, Modbus TCP/IP gateway, and TLS proxy server for HTTPS and user-defined-port communication. Released in 2011, the NL240 was the first Campbell Scientific device to provide Wi-Fi connectivity over 802.11b/g/n wireless networks. Along with this connectivity, the NL240 provides you with access to all the IP capabilities of our IP-enabled data loggers (viewing of web pages, email capabilities, HTTP, and FTP). The CC5MPX digital camera was released in 2011. This high-quality, low-power camera was designed specifically for your outdoor observations in remote locations, capturing the still or video images you need. You can control this camera by an internal timer, motion detection, a web page interface, or a data logger. 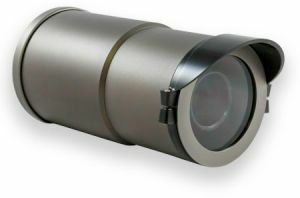 The CC5MPX can function as a stand-alone camera or transmit images back to your data logger, which, in turn, can transmit those images back to your computer or display them in a web page. The CC5MPX also supports transmission of your images via FTP. The year 2014 saw the release of the CR6, our first data logger to offer an integrated Ethernet connection. Like our other IP-enabled data loggers, the CR6 is capable of serving up web pages, email send/receive, FTP, and HTTP. 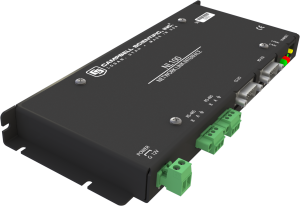 This data logger supports Ethernet 10/100 and includes programming instructions to control power to the Ethernet port for your applications that are running under a limited power budget. In 2015 we added Wi-Fi capability to the CR6. Supported Wi-Fi technologies include 802.11 b/g/n, WPA/WPA2-Personal, WPA/WPA2-Enterprise Security, and WEP. With communication rates of up to 72 Mbps over 802.11n, the CR6-WIFI handles your communication and other IP tasks without delay. The ability to do both Ethernet and Wi-Fi allows a CR6 datalogger to aggregate your data from remote data loggers wirelessly, while transmitting your data to a server over Ethernet. As you can see from this article’s brief product history, Campbell Scientific has been helping you access your data via the Internet even before the world was concerning itself with the Internet of Things. 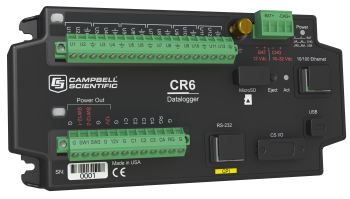 And while the CR6 is our first data logger to support integrated Ethernet and Wi-Fi communications, we don't expect it to be our last. Over the years, how have you used Campbell Scientific's Internet-enabled data loggers or communication devices to “do your thing”? Post a comment below, and share your special application story. We have been looking at the emerging narrow band technologies that are coming to the market here in new zealand and rolling out globally at varying levels of maturity. The technology we are most interested in is vodafones NB-iot that is currently active in europe and australia and I believe being trialled in the states at present..
Is CSI looking at incorporating this technology in a product say similar to the CR300 cell200? or maybe as an option for the wirelss sensor deployment ? Thank you for your comments. We are always keeping our eyes on new technologies and investigating where they may be put to good use in the applications we serve. If you want, drop me a quick note with your contact info (dana at campbellsci dot com) and I will pass it on to our datalogger and communications product managers. They may be interested in understanding your application further.